Double posted on the Robo-blog. Every Sunday, I go down to Grant Park with my Pomeranian, Fritz. We go for a little walk, we poo poo, I pick it up, we feed pigeons little pieces of bread and just enjoy the day. 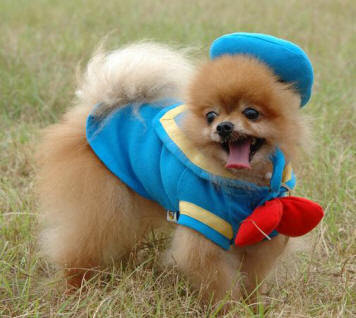 Here's a picture of Fritz, in case you as well love Pomeranians. Well this Sunday, Fritz and I took out little walk and, as we were walking towards the bench where I always - always - sit and feed the pigeons, there were two goddamned hippie kids kissing each other French style! And then I heard the noise! And the smell of unwashed teenagers and twenty year old youngins! And the faint stench of vodka mixed with 7-Eleven Big Gulp drinks! And I said to myself, goddamn it! It's one of those damned Lollypaloser rackets they do every summer! Fritz was not happy either. Isn't that right, Fritz? I decided to take Fritz home to our condo and sooth his nerves with a freshly baked doggie treat - I could tell all the hippery was playing with Fritz's constitution - but everywhere we went there were damned kids dancing and singing and vomiting and carrying on. At about 5:30 PM, one of the so called "bands" took the stage and it was particularly odious. I don't understand how people can call that music. Ella Fitzgerald, now that was music. Now a days, bands have such weird names, like "Arctic Monkeys." That doesn't even make sense, "Arctic Monkeys!" Monkeys don't live in the Arctic! Penguins do! Even Fritz could tell you that! Well, needless to say, I plan on complaining to my alderman. This racket needs to stop. The only thing that could possibly be worse is if we get the Olympics, with all those greasy foreigners running around. Fritz would have a fit.